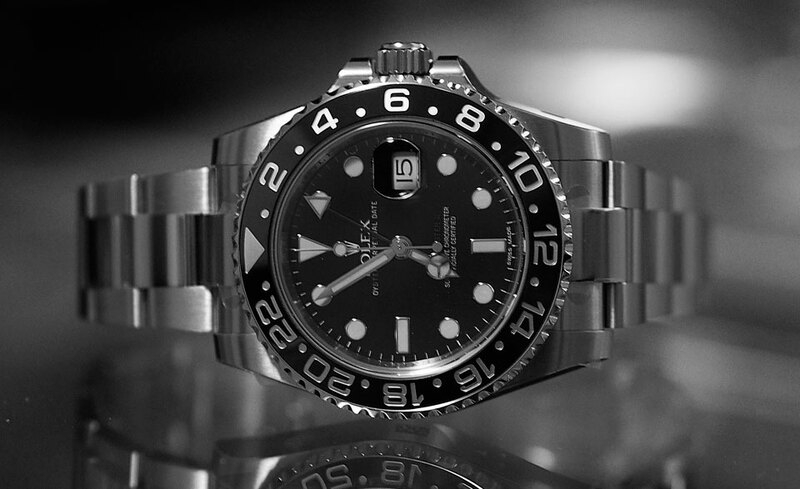 When Rolex unveils a new watch, they do it when they plan to do it. 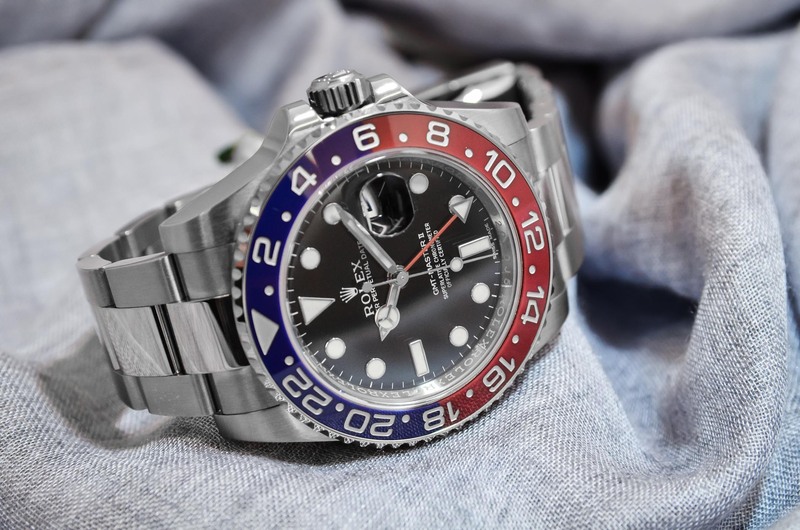 As we told you before, when we were guessing what the new Rolex novelties for 2014 would be, is that Rolex’ secrets seem more secure than the famous Swiss banks. 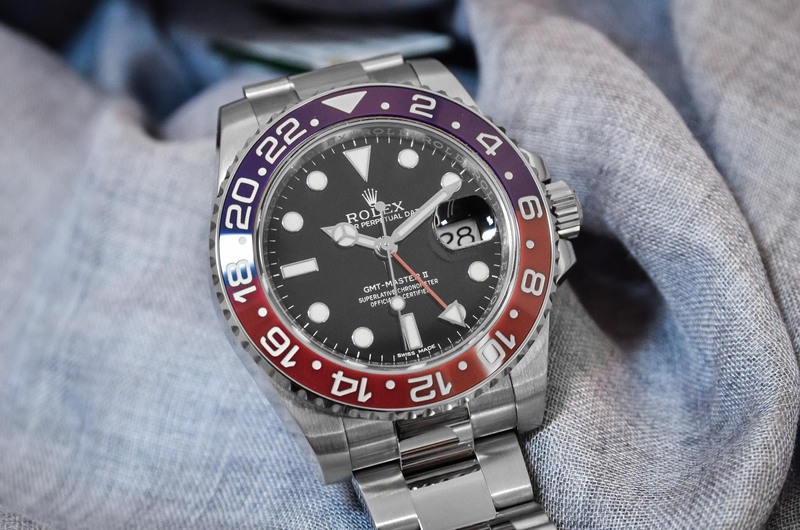 Our guessing was actually pretty accurate and one of the models we hoped to see, was the new Rolex GMT-Master II Pepsi with red/blue bezel. The new ‘Pepsi’ caused quite some mixed emotions at the Monochrome headquarters. At the moment that Rolex opened the windows of their Baselworld booth (you can easily call it a large house or a huge 3-story boutique) we were attending the Tudor press conference, where we were presented the cool new Black Bay Blue, Mario -who was not present at B-world- sent us a text message with a link to the Rolex novelties. Suspense… YES… a Pepsi! As quick as the enthusiasm exploded, it faded away again. The reason for that was that Rolex decided to make their most desirable novelty in years, in WHITE GOLD. Now usually the metal of a new timepiece is a journalistic jotting. However, when a watch is on our personal shopping-list that becomes an important factor and all journalistic ‘neutrality’ vanishes. 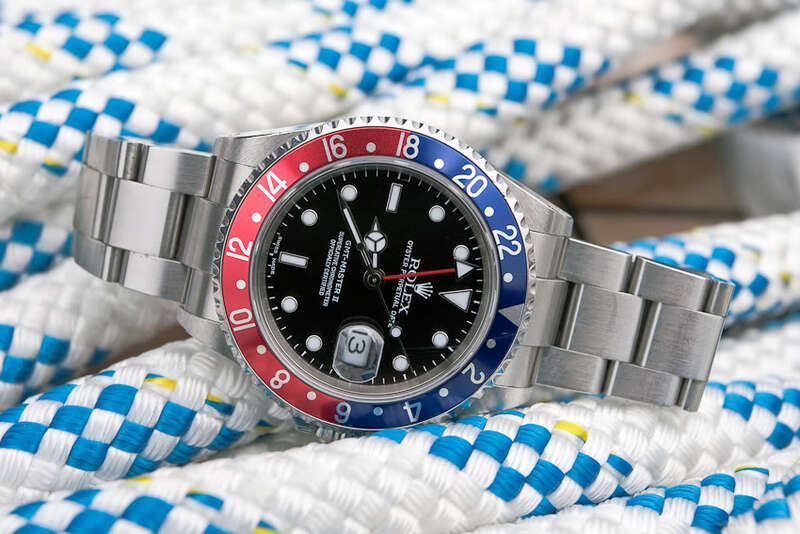 The white gold Rolex GMT-Master II Pepsi has a 20k Euro higher price tag than the GMT-Master II 116710 BLNR that was introduced last year. We realized that we’ll have to put coins in our piggy bank for many more years, and we won’t be able to buy the new Pepsi for ‘that life-changing event’ later this year. The new ‘Pepsi’ does look very good, and it actually looks exactly as we hoped it would look like. What we hadn’t realized is that creating a blue/red bezel was kind of difficult. Or better, you can easily label it ‘next to impossible’. 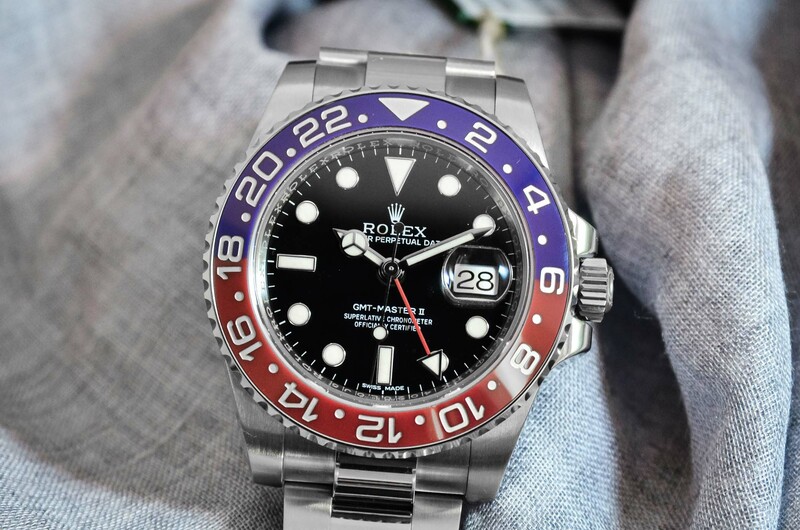 And that was the reason that Rolex hadn’t created the ‘Pepsi’ in Cerachrom before. The name “Cerachrom” derives from a contraction of the word “ceramic” juxtaposed with the suffix “chrom” from the ancient Greek word for “colour”. The range of available shades for ceramic is however restricted by its very manufacturing process. Colours are generally created by adding mineral pigments that can withstand the very high temperatures at which the ceramic is fired for its densification and to acquire its characteristic hardness. Red, typically, is a colour for which no stable mineral pigments exist to create a Cerachrom component. 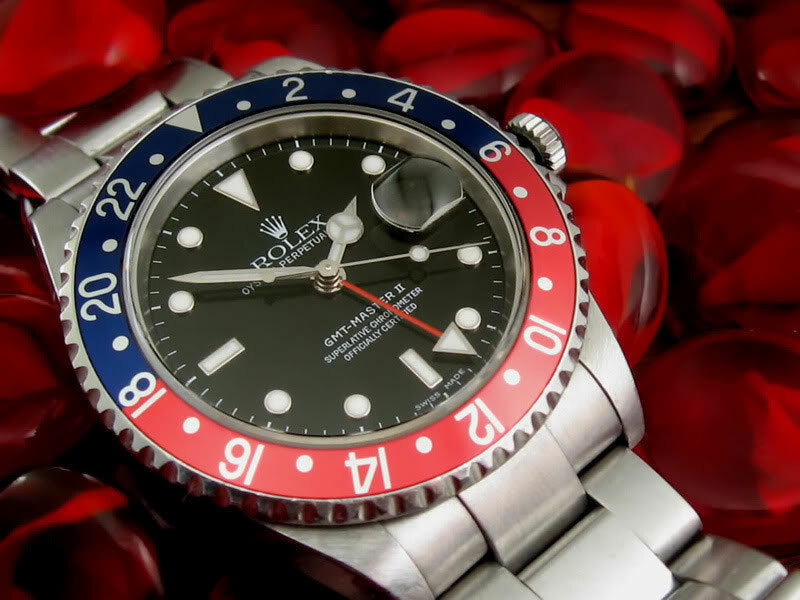 Rolex nevertheless managed to produce a red ceramic. But this innovation represented only half the journey. The Oyster Perpetual GMT-Master II has been our favourite “multi-purpose” travel watch for a long time. There simply aren’t that many competitors when you think of its specifications. A) wears very comfortable B) looks good with suit AND with a casual outfit C) water resistant and can actually be worn on the beach, in the sea, or in your hotel’s swimming pool and D) its make is impeccable and solid. Just thinking of these qualifications, the only options that come to mind (and I hope you’ll forgive me for the ones I forget) are the Jaeger-LeCoultre Master Compressor Geographic, the Girard-Perregaux Traveller WW.TC, Patek Philippe’s Aquanaut Travel Time and the new Nautilus Travel Time Chronograph and the Seamaster Planet Ocean GMT that Omega introduced last year (we’ll have a review for you in two weeks). So, steep competition, however not that there’s a choice between dozens of high-end watches with similar specs. 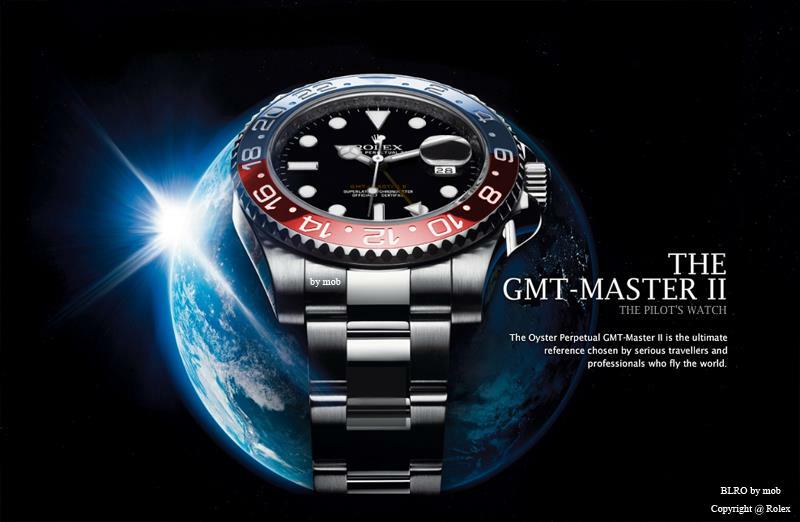 The GMT-Master has been one of the very first traveller’s watches since Rolex introduced the first version in 1955. At that time, intercontinental travel developed, and airliners began to fly swiftly across several successive time zones. Pilots and travellers alike wanted to know the time in various places in the world, such as the airport of departure and arrival. The GMT-Master was developed to meet the specific needs of airline pilots and it became the official watch of the famous Pan American World Airways, better known as Pan Am. 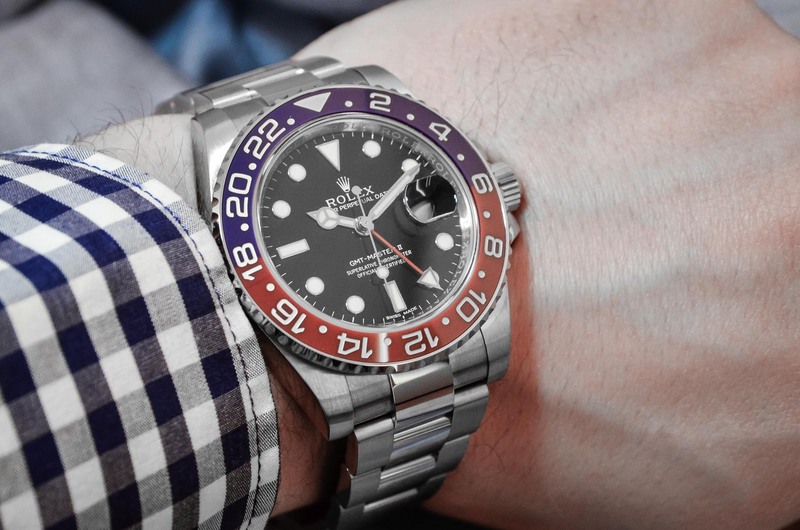 The advantage that the GMT-Master II has over many ‘standard’ GMT watches, is that the 24-hour hand will keep indicating the ‘home time’ (so you’ll know when to call your family or office, and when they are asleep), while you can adjust the normal hour hand to the destination you travelled to, so it indicates your local time. On the wrist it wears comfortable, the steel bracelet can be adjusted (and micro adjusted) to fit your wrist perfectly. 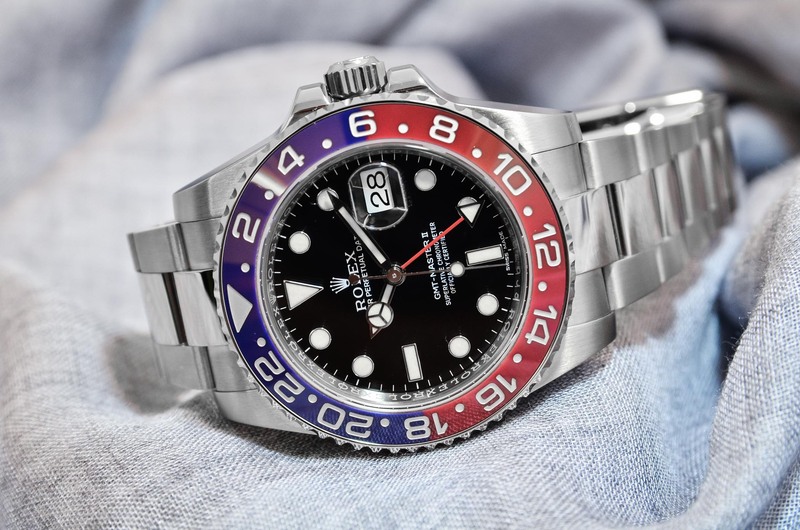 Although we must say that the GMT-Master II Pepsi ref. 116719BLNR is quite heavy, due to the use of white gold for the case and bracelet. And that is, again, the only complaint we have. White gold is heavier, less resistant to scratches (especially compared to the hard 904L steel that Rolex uses) and it is 20k Euro more expensive. However it still ranks among our favourite travel watches, as being the ‘mother of all travel watches’. The ceramic’s sheen enhances the colours in a way that is reminiscent of the Plexiglas insert of the original GMT-Master, introduced in 1955. 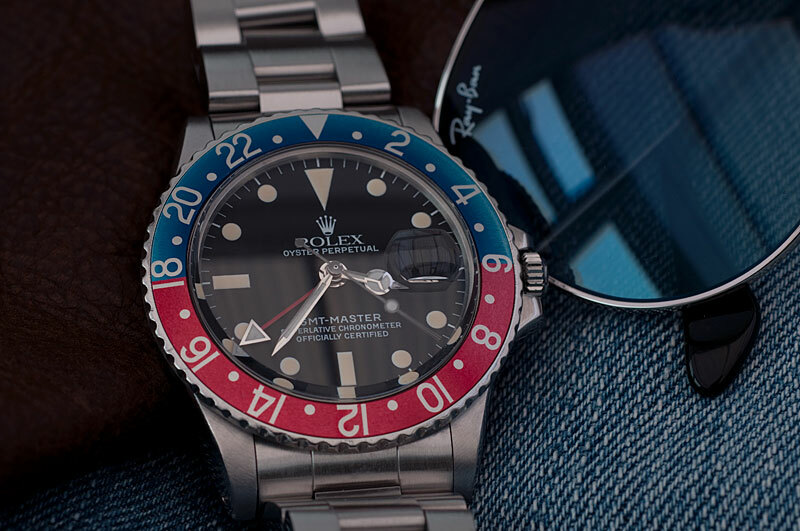 More info on the Rolex website here.